Pattern Description: Misses Six Sizes in One Just 4 Knits. Includes one drape neck top and one mock wrap top plus skirt. I made the drape neck top as I have been coveting that kind of top for a long time. Pattern Sizing: Sizes 8-18, I made the size 12 with a cheater FBA from Debbie Cook’s blog after a disastrously ginormous muslin in a sz 16. Did it look like the photo/drawing on the pattern envelope once you were done sewing with it? Yes I guess. It’s just an illustration, so you don’t get a real sense of how it fits. Were the instructions easy to follow? The instructions were pretty easy to understand even for a beginner. What did you particularly like or dislike about the pattern? I love the drape neck but wonder if it really works for a c cup size or larger. I had difficulty making it work with my girls even after the FBA; it kept draping behind them. Hard to describe though. The pattern has a facing for the back neck which I found really hard to work with. Sewing it completely distorted the neckline on my muslin. So for my final version, I just folded the back neck over and sewed it done. Perfectly serviceable and minimal distortion. The sleeve cap ease is RIDICULOUS. 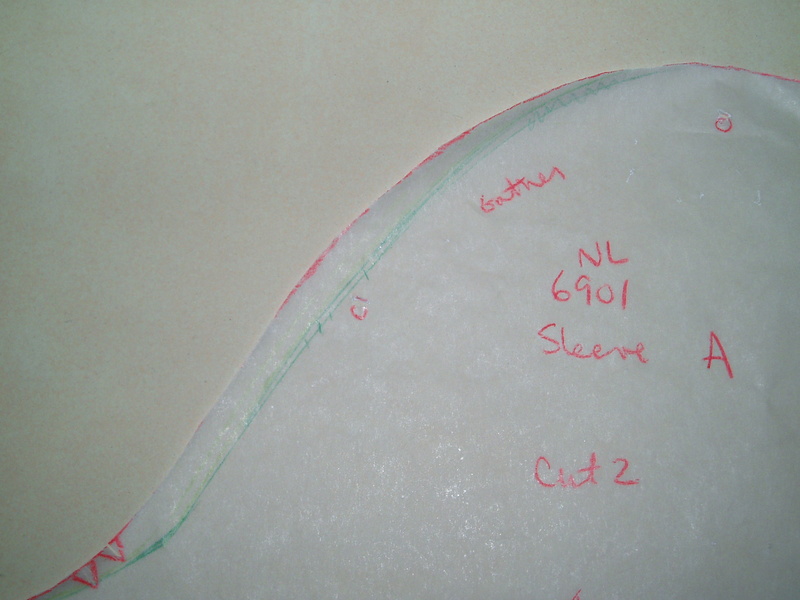 My sewing teacher redrew the sleeve cap for me, but it was still too big when I made the final version. I still needed to ease it in. Fabric Used: I used a cotton lycra knit from which I have made a dress in the past. I have so much left over that I am using it for knit muslins from now on. I bought it from Gorgeous Fabrics back in the beginning of my on-line fabric days when I didn’t know how much yardage I needed for any given project. Ahh learning curves, love ’em or hate ’em? I used a blind hem stitch on the sleeves (see picture above) and should have done the same for the hem of the shirt, but instead tried out stitch witchery. What a mess that stuff is. Due to lack of planning, I had some SW scraps on my ironing board and accidentally adhered them to my iron. What a PITA!!!! 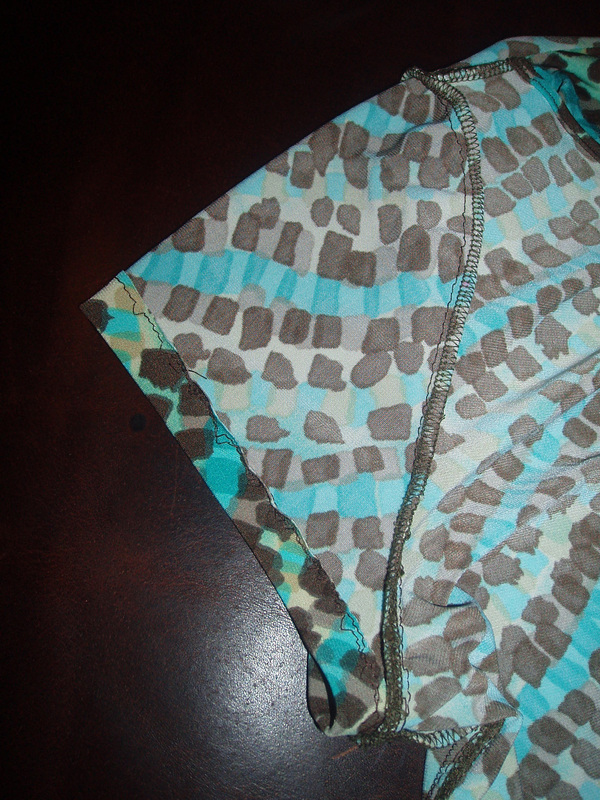 Anyway, the hem is a little wavy, but seems secure. I don’t know if it will hold up in the wash though. Guess I will find out soon enough. 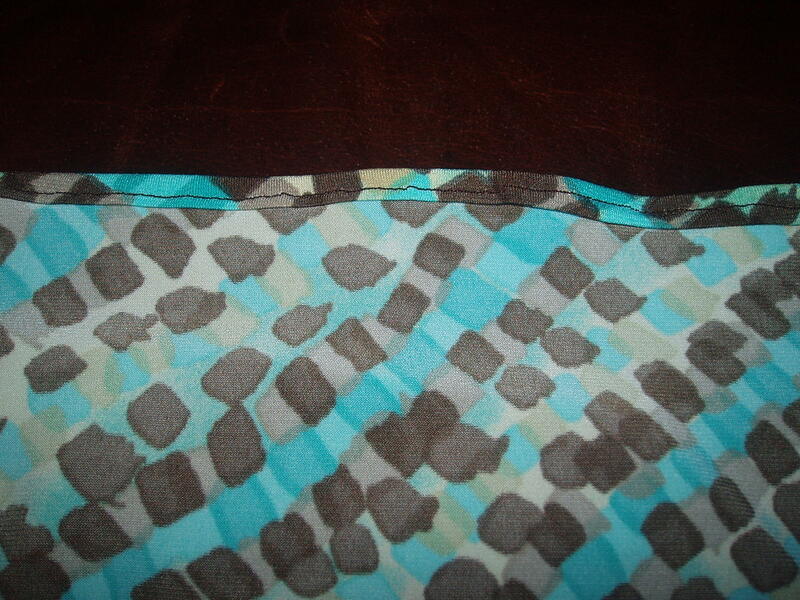 I really need to get on the twin needle band wagon or see if I can find a used coverstitch machined on craigslist. I already mentioned the sleeve cap alteration and the neck band change I made above. Conclusion: Cute pattern for smaller busted women. Sizing is ginormous. But instructions are easy to read and understand. This entry was posted in Beginner, Fitting, New Look, Pattern Alterations, Pattern Review, Sewing, TNT's, Tops, Work Wardrobe. Bookmark the permalink. Love your blog. Lots of fun to read. I feel like I am in the same boat you are most of the time. I have such a hard time with sizing/fitting. 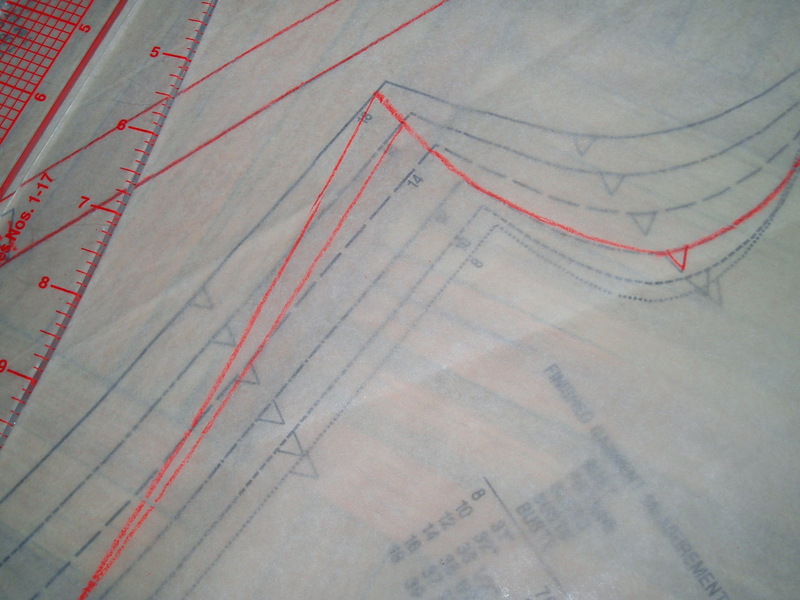 Are you flat pattern measuring? I find this helps a little, especially with dart-less, knit, or looser garments. I still don’t know how to get a real bodice to fit right. Thank you for the review—I think that you look good with the v-neckline, and I think that the cowl neckline works in this instance. But if the neckline isn’t draping in a way that you feel comfortable, then I guess that it doesn’t work for you. Sorry to hear the sizing doesn’t feel comfortable for you. I always think that draping necklines look especially good with people with a bit of a larger cup and in the pictures the top looks great on you! I think the top looks great on you! 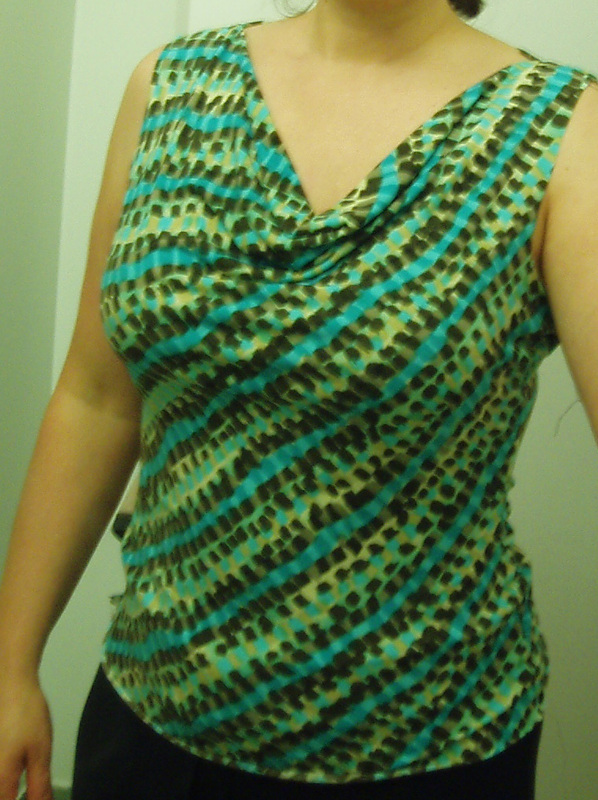 I just made a cowl neck dress (S2580) that really worked for me – pics to come next time I wear it. I think Simplicity patterns are on sale at Jo-Ann’s starting today, also – I’d be curious to see what you think of that cowl neck. Your top looks great – knits can be tough to work with at times! For a drape neck top I really liked Vogue 8597 – but I’ve got a small bust – however there’s a darted version so an FBA would be a bit easier. I use a twin needle for hems and such (as I’m still wishing for a coverstitch machine), all I do is stabilize the hem with a narrow band of knit interfacing. Seems to work! Yup, I have to make this soon. Thanks for the warning with the sleeve cap. Thanks also for your recommendation regarding V8379. I want to use the collar though so maybe I have to have the facings? Hrm.